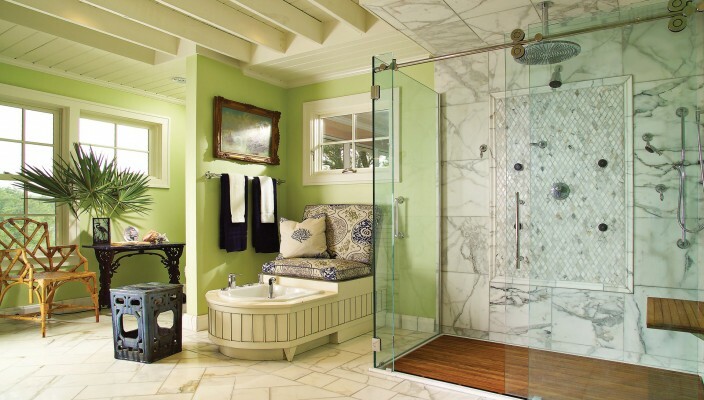 This simplistic bathroom design is about style and functionality with use of glass shower cabin along with the walls in a unique shade of green. This simple yet elegant bathroom concept works for large spaces with use of a large glass shower cabin that brings extra gloss to the design. The walls are in a stunning shade of green with use of a few items for coziness. The design mainly works for its unique appeal and the floor finish in marble. In a sharp contrast, the design of floor in the shower cabin is in wood, which brings some more hues to this modern bathroom.